Every chicken feeder we've ever used has wound up full of chicken scratch, chicken manure, and then been tipped over when the chickens got to scrapping with each other. So we thought about it, applied some of the principles we used in our other videos, and came up with a great new way to feed chickens. 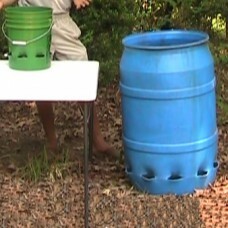 The concept is simple; we take a used food-grade 5-gallon bucket and make pockets in it, make a hollow spot in the center of the bucket so grain will flow to the holes, and voila, a chicken feeder; if a barrel is used, it can supply enough food for a typical small chickenhouse for months at a time! Mix your own feed right into the barrel, put the lid on it and go on vacation knowing your chickens will be fed the whole time! But we had the same problem with waterers; they're expensive, they leak, they get roosted on, and half the time they don't even work. Or they get full of dirt, they have to be filled manually every day... if you have chickens, you know what I'm talking about! Since we invented this waterer, we've never had any of those problems. We have a float valve to keep the water level constant, a container that chicks can reach but not fall into (but for safety, make the holes a bit smaller if you're raising chicks), and of course... something that costs very little and uses mostly recycled materials! These two systems are both included in this one video, with complete detailed instructions on how to make each! And it is available for less than buying a single chicken feeder or waterer from the feed store! And with this information, you can make dozens! Please note that this is available only as a digital download for right now; if there is sufficient demand, a DVD will be made available in the future (email me if you really need one, and we'll see what we can do).